I took part in a delicious strawberry-themed potluck a couple of years ago. Some creations were great (strawberry pizza with basil, buffalo mozzarella with olive oil and balsamic vinegar), some were not as successful (my partner’s strawberry s’mores–sorry, James). My favourite dish of the night was the strawberry salsa. 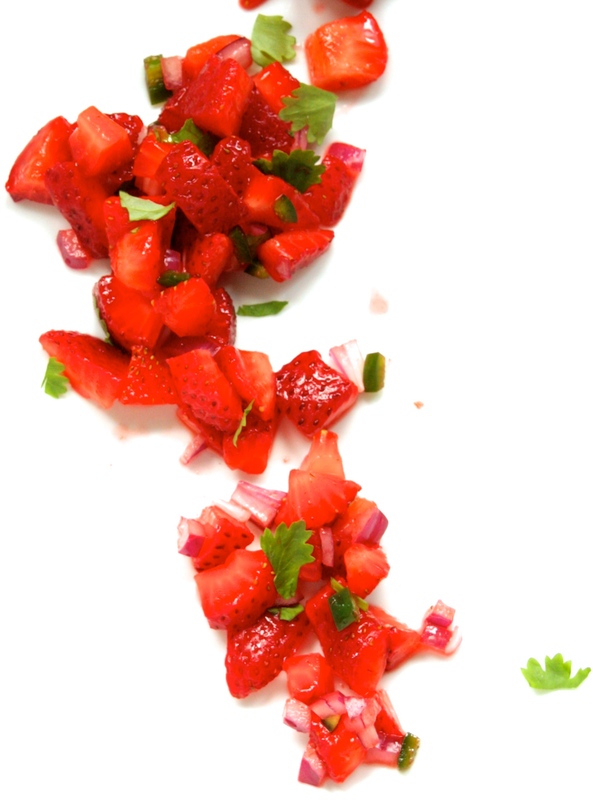 This salsa is perfect at the time of year when strawberries are in season and tomatoes aren’t–the season we call spring. The strawberries are no mere understudy, though. They make for a killer, savoury but, of course, slightly sweet salsa that might make you forget about tomato salsa altogether, until their times in the spotlight/sunlight, switch. At which point your loyalties, understandably, will switch. Seasons change, feelings change. Don’t make this recipe too far in advance, as the strawberries sort of pickle in the salt and lime eventually. 4-6 hours ahead is fine. For a richer salsa, add diced avocado. Combine ingredients well and adjust seasonings. Allow to sit at room temperature for at least half an hour. Transfer to a bowl to serve with tortilla chips and sprinkle the salsa with freshly sliced cilantro leaves. You could also use the salsa to top burgers, deep fried mushrooms or zucchinis or in a billion other tasty ways. This story and recipe appear in RED, Issue 001 of Le Sauce Magazine. Looks yummy…I will have to try this.